The early meetings and services were held in adapted buildings: a hayloft above the stable in Plein Street and a disused wine store in Barrack Street. In 1822 a church a mission house was erected (also in Barrack Street) at a cost of £600. Dr. John Phillip conducted the official opening and the building served as both a school and a church. A key figure in the church in Cape Town at this time was the Rev. Barnabas Shaw who arrived in Cape Town in 1816. Together with the Rev. E. Edwards and the Rev. 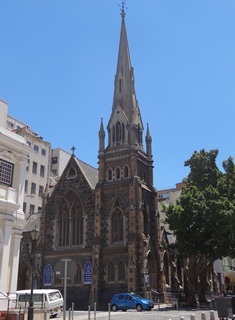 T.Hodgson, Shaw played a major role in the growth of tile church in Cape Town and this culminated in the erection of the Wesleyan Methodist Church on the corner of Burg and Church Streets in 1829 (Methodist House now stands on this site). A memorial tombstone in memory of Barnabas Shaw, who is regarded as the founder of South African Methodism, can be found on the ground floor beneath the tile gallery at the back of the existing church. After some time back in England, Thomas Hodgson returned to Cape Town in 1836. He set about seeking to reach the many slaves and ex-slaves who never attended church, by preaching on the Grand Parade. Hispreaching met with a violent response and Hodgson started raising funds for the erection of a church where he could preach without disturbance. As a result of his efforts, the Sidney Street Church was opened in 1837 and, although it grew rapidly, it tragically marked the beginning of the racial separation of Methodists in Cape Town. The church in Burg Street became a predominantly White church and Sidney Street became a predominantly Coloured church. The Wesleyan Church in Burg Street gradually felt the need for a larger church and in 1875 purchased the site on which the Metropolitan Church now stands for £1 850. The church was built under the supervision of Charles Freeman (architect) and TIC Ingelesby (builder) in 1878/79 at a cost of £17700 and opened on 12 November 1879.The church was attended by many prominent citizens of Cape Town and was famous for its fine preachers and outstanding choirs. The Rev. Ernest Titcomb conducted the first radio broadcast of a church service in South Africa from the Metropolitan Church in 1928 and large crowds gathered to hear his fine preaching. Metro (as it was affectionately called) continued to attract large congregations until the 1960s when urban sprawl and other factors began to take their toll and attendance and membership declined. By the late 1980s only a few dozen people attended services. 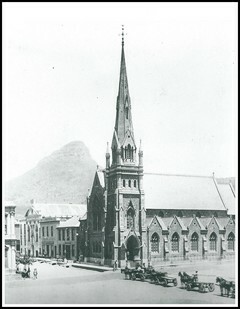 The Sidney Street church was sold in 1882 and in 1883 a large wine store was purchased on the comer of Buitenkant and Albertus Streets and converted into a place of worship for the congregation.Buitenkant Street Methodist Church (as it was known) served the people of District Six and was a thriving congregation until District Six was declared a White Group Area in 1966. Thousands of people were forcibly removed from their homes. During this time of upheaval the congregation participated in the growing resistance to apartheid and in particular to the destruction of District Six. A Plaque of Shame was mounted on the church building to remind passers-by of the injustice that bad taken place (the plaque is still in place). Despite attempts to break the spirit of the people through forced removals, detention and harassment, the congregation continued to commute from the suburbs to Buitenkant Street on Sundays and a lively congregation of more than 100 people still worshipped regularly in the late 1980s. These two congregations maintained their separate witness until 1988 when they decided to amalgamate and form the Central Methodist Mission. This commitment to be obedient to God’s call to unity has borne much fruit, and today a vibrant congregation with more than 200 members worship at the church on Greenmarket Square. The Buitenkant Street church accommodates a number of outreach projects to the people of the city, includingthe Ons Plek Shelter for Female Street Children, Stepping Stones Children’s Centre and the District Six Museum. Apart from worship services, both Buitenkant Street Church and (since 1988) the church on the Square have been venues for protest and other community events. Many regarded Buitenkant Street Church as a place of sanctuary during the turbulent 1980s. Families of detainees and victims of police brutality were offered sanctuary whilst trade unions and other community-based organisations used the venue for public meetings. In 1990 the Metropolitan Hall hosted the first ANC press conference after the unbanning of the organisation. Protest meetings were held in the church on a regular basis until 1994 and large crowds gathered to hear speakers such as Nelson Mandela and Thabo Mbeki. More recently the church hosted the launch of the Gun Free South Africa campaign where many children handed in their toy guns as a sign of their commitment to the campaign. CMM also hosted the World Methodist Council Peace Award Ceremony for Nelson Mandela in September 2000.